I worked on the drawing again today. This is my fourth drawing for the Porter Mill Challenge, which is to create a piece of art each week for 4 weeks. I decided to make one still life drawing per week, and I got this one in under the wire. Each of my drawings is of a container of flowers on a patterned tablecloth. All of them were drawn with conte crayon and conte pencil, and they all have a very similar off-center composition. I plan to show them as a set of four in the upcoming Porter Mill Show. Today I started by straightening out lines and eclipses, and then I worked on revising the color scheme. Finally, I added some detail to the flowers. I know there are some things to fix, but this is the basic drawing. I started this drawing today, my fourth and last for the Porter Mill Challenge (to produce one new piece of art each week for a month.) This is the last in a set of four still life drawings done with conte crayon, each with a slightly off-center composition and each with a patterned tablecloth. I spent a couple of hours on this because I am pushing to get this finished by tomorrow (last day in April), but we will see. I did a lot of preliminary work to measure and set up the composition so this drawing will "match" the others if they are displayed together. Then I sketched in the composition and spent some time drawing the flowers. I roughed in some colors for the background, just to get some ideas, but I am pretty sure the colors you see are not the final colors. There are lots of errors to clean up because I was working pretty quickly. Tomorrow I plan to straighten some lines, whip some elipses into shape, and improve the color scheme. This is the drawing I have been working on for the Porter Mill Challenge (to produce one new piece of art each week for a month.) My plan is four still life drawings done with conte, each with a slightly off-center composition and each with a patterned tablecloth. Even though I thought this drawing was just about finished yesterday, this afternoon I went back to it. I had noticed that the vase was not quite symmetrical, so I started by working on that. I also added some detail to the flowers and reworked the colors in the tablecloth. This is the third drawing I have produced, but I have one more to go by the end of April, so it is time to start the next drawing. I already bought some more flowers for another still life (yellow mums), so I hope to get that started tomorrow. This afternoon, I did some more work on the still life that I started yesterday. This is for the Porter Mill Challenge to produce one new piece of art each week for a month. So I am doing a set of four still life drawings, each with a slightly off-center composition and each with a patterned tablecloth. This is three out of four and I am pushing to finish all four by the end of the month. Yesterday I established the composition, and today I modified it just a bit by adding one my flower for balance. Then I worked on the shape and color of the vase, and the background colors. Throughout I continued to try to improve the flowers. I am working from a lovely vase of freesia and they are holding up quite well. I think this is the basic drawing, though I may do some cleanup and make small changes. . . . 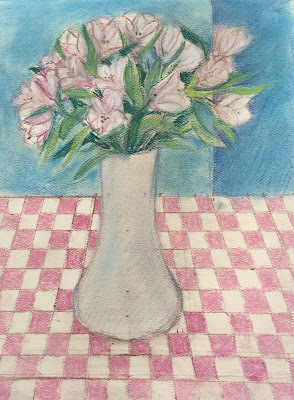 Yesterday I bought some freesia to draw, and today I finally had a chance to start this still life. This is for the Porter Mill Challenge -- a challenge to artists at Porter Mill to produce one new piece of art each week for a month. So I am doing a set of four still life drawings, each with a slightly off-center composition and each with a patterned tablecloth. Today I started by laying out the composition, measuring to make an rough match with the placement in the other two drawings. Then I sketched the shapes of flowers and vase, and decided to measure and lay in the pattern for the tablecloth. I am a bit behind on this challenge, so I decided to spend some extra time on this, and kept going, adding some detail to the flowers and trying out colors for background and tablecloth. My drawing is still pretty rough, but I needed to stop. To be continued. . . .
A friend of mine recently challenged me to participate in a Nature Photo Challenge: go outside, enjoy nature, take pictures -- and post a picture each day to Facebook. So I have been taking a lot of pictures, far more than the one per day for the challenge. It's a great time to do this because things are starting to bloom. 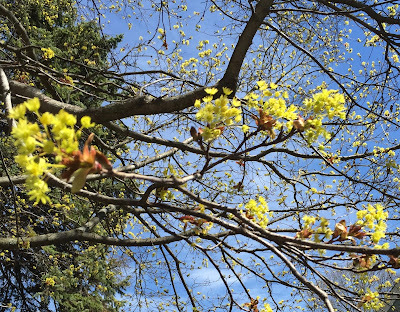 This was my photo for Day 3 of the challenge, my dogwood tree just beginning to blossom. 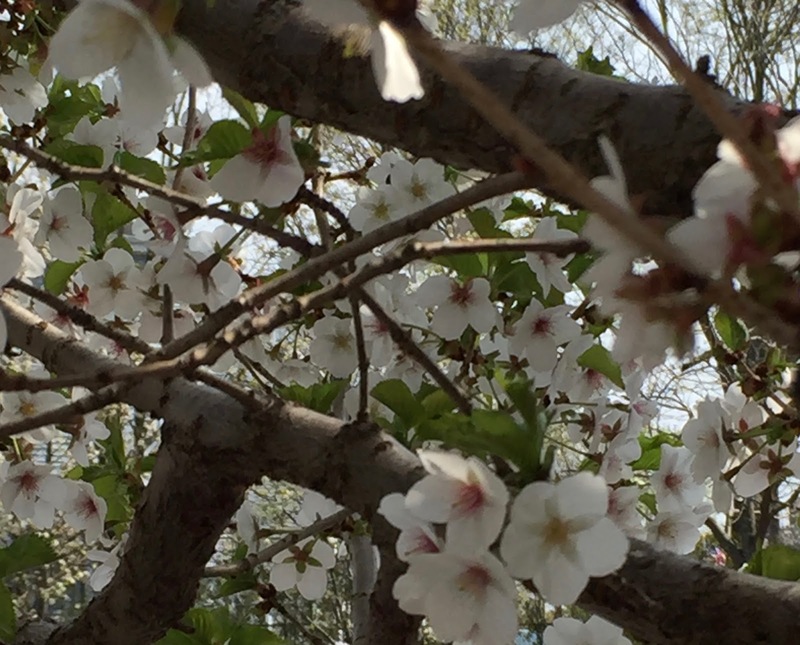 I saw this lovely tree in bloom while I was walking on the block where my daughter lives. It was nearly 70 degrees, so we took the dog for a walk. It's great to walk with a dog because she likes to stop and investigate, and that gives me a chance to take pictures. When I got home, I cropped this image out of the original photo. A friend invited me to participate in a photo challenge, to post a nature photo to Facebook every day for a week. 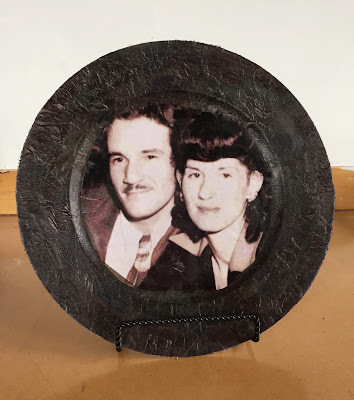 So I am going to use this photo for the second day of the challenge, in addition to posting it here. My friend invited me to participate in a photo challenge, to post a nature photo to Facebook every day for a week. Well, I didn't wander far into nature. I was short on time so I settled for our little walk around the neighborhood with the dog. It was a great day to it because it was close to 70 degrees and the trees were starting to leaf out. I love the way the new leaves look so I took some pictures. Tonight I cropped this image out of one of the photos and am posting it here as well as on Facebook. I have been meaning to post this. This is a photo of the tulips that that I used last week as a reference for my drawing. 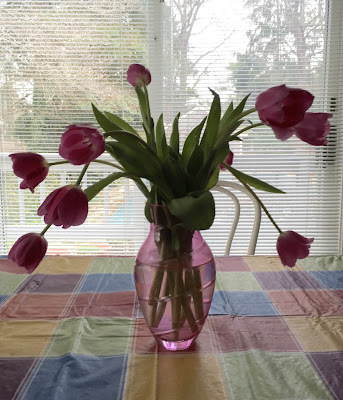 I made the tulip stems shorter to get the composition to work. And I used simple blocks of color for the background. I didn't draw the tablecloth as it is, but certainly used it for inspiration. This still life is going to be my second drawing for the Porter Mill Challenge. (Porter Mill artists have been challenge to create one new art work per week for four weeks.) My plan is four still life drawings with conte crayon, each of a container of flowers on a patterned tablecloth. Today I worked on this one a bit, sharpening colors and lines. I may do a bit more to the background, but apart from that, I think the drawing is finished. Of course, I have said that kind of thing before. . . . I have been working on this drawing for the past few days. I am doing a set of four still life drawings for the Porter Mill Challenge. (The artists at Porter Mill have been challenged to produce one piece of art each week for four weeks, with the results to be displayed in a show in May.) Each of my drawings will have the same slightly off-center composition, and will show a container of flowers on a patterned tablecloth. Today I concentrated on the vase, measuring and checking and revising for symmetry. 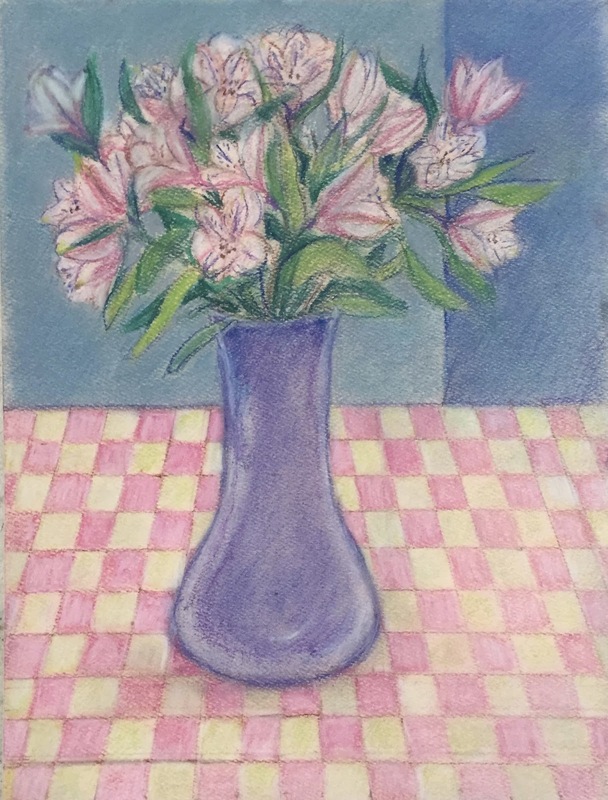 I also added color and highlights to the vase. I plan to make some small changes and to sharpen up colors and lines, but this is the basic drawing. This is the still life drawing I am working on for the Porter Mill Challenge. (This is a challenge to artists at Porter Mill to create a new art work each week for four weeks.) 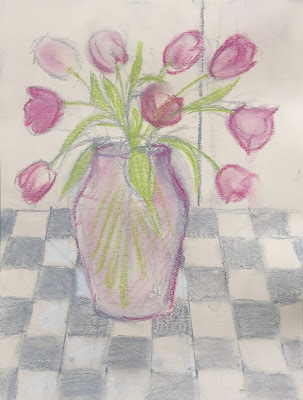 I am doing four still life drawings with conte crayon. Again I was short on time, but I used the time I had to work on the tablecloth, straightening out lines and brightening the color. This is almost done and I hope I can finish this tomorrow. I have been working on this drawing as part of the Porter Mill Challenge. Artists at Porter Mill have been challenged to produce one new piece of art per week for four weeks. 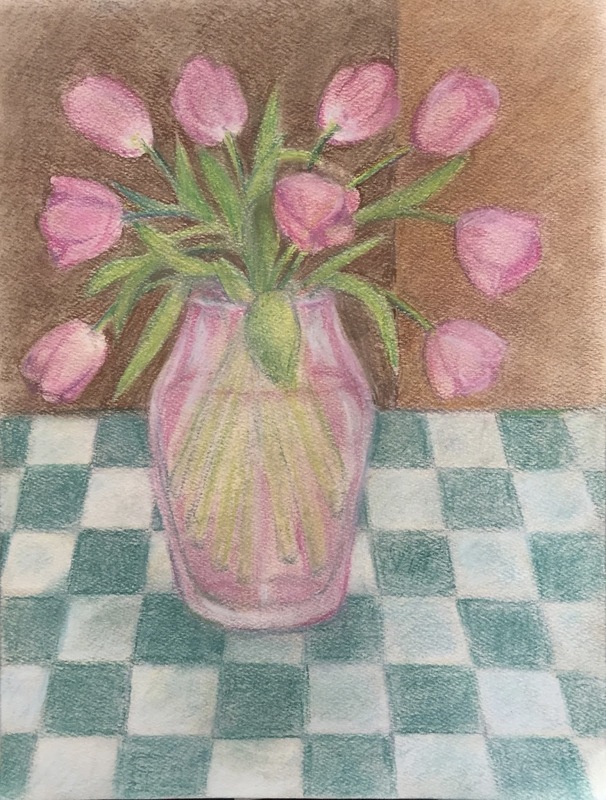 I am doing four still life drawings with colored conte, each one a container of flowers on a patterned tablecloth. I didn't have much time to work on this today. I used the time that I had to work on the background, deepening the color. I switched to conte in pencil form to do some detail around the stems and leaves. 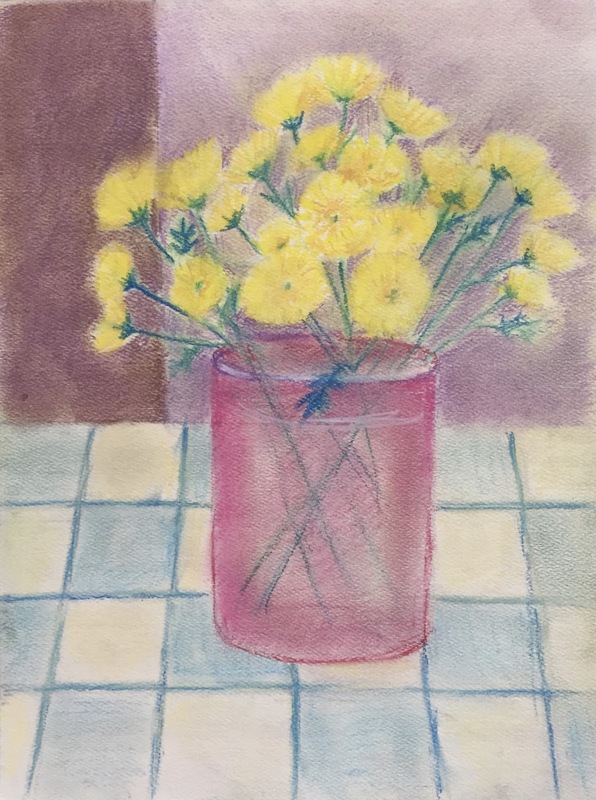 I also sharpened up some of the lines of the flowers, and did a little work on the color of the tablecloth. I hope to finish this in the next day or two. This is the drawing I have been working on for the Porter Mill Challenge. (Artists with studios at Porter Mill have been challenged to produce a new work each week for a month, with results to be on display next month.) 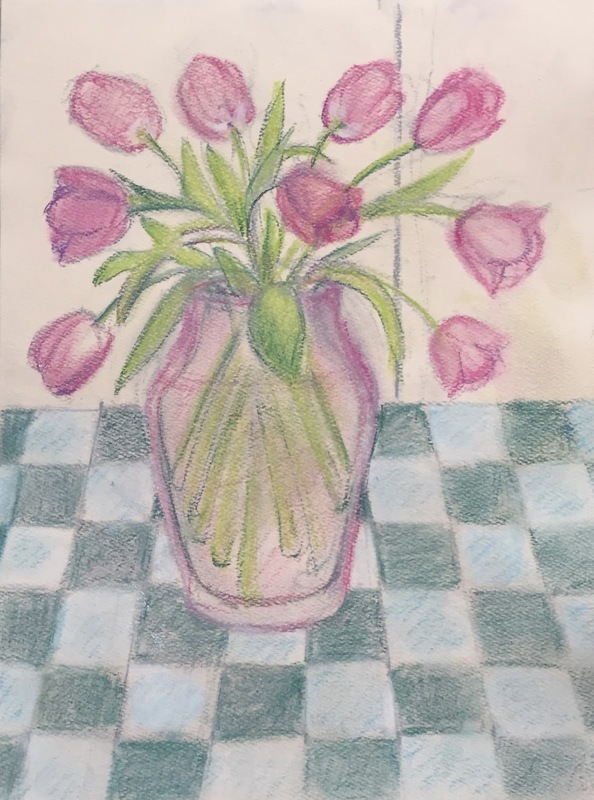 So I am drawing one still life per week, flowers on a patterned tablecloth. 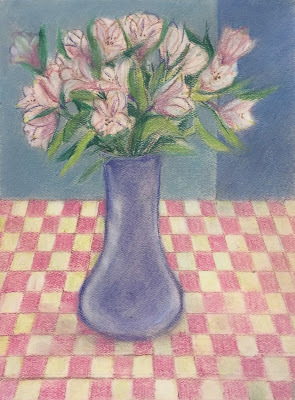 I didn't have much time to work on this today, but in the time available, I suggested some shadows on the tablecloth and some highlights on the vase. Then I roughed in some background colors. To be continued. . . . Along with some of my fellow Porter Mill artists, I am participating in a challenge to create something new each week for four weeks. 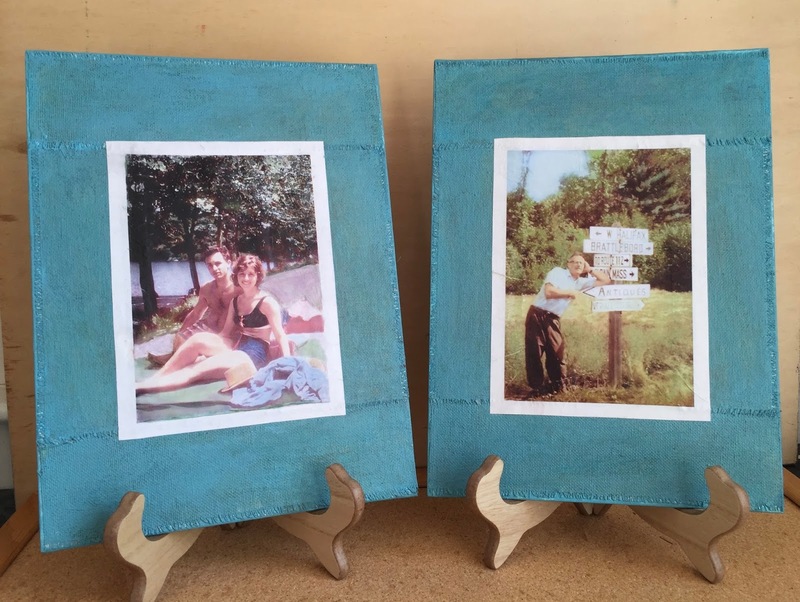 The results may be put on display at Porter Mill Studios later this spring. 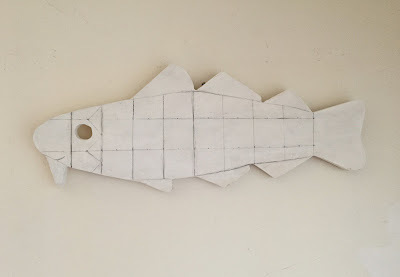 The drawing I am currently working on will be my second piece for the Porter Mill Challenge. 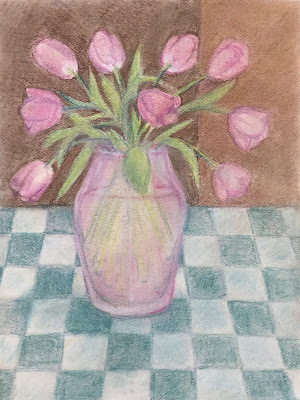 I am planning four still life drawings (in conte crayon), each of a container of flowers on a patterned tablecloth. 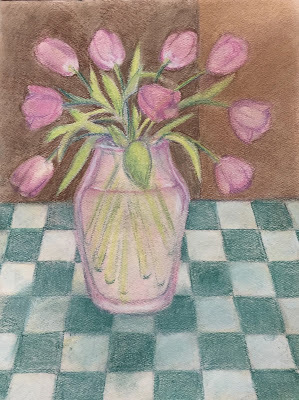 I started this drawing yesterday, working from a bunch of tulips that I bought. Today I kept going, and started with adding more detail to the tulips, which are already drooping. Then I worked a bit on the vase and the tablecloth. To be continued. . . I made a beginning with this drawing today. 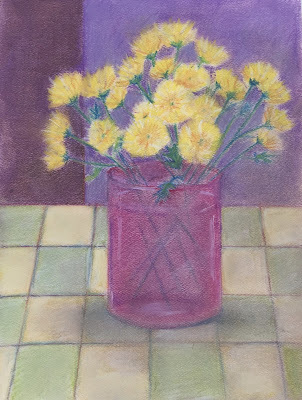 This is another still life done with conte crayon. 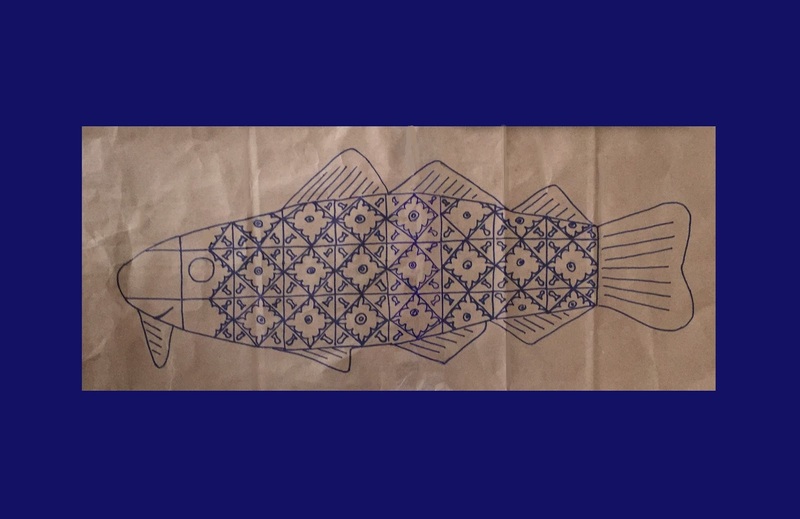 This is for week 2 of the Porter Mill Challenge; some of the artists who have studios at Porter Mill are participating in a challenge to produce one piece of art a week for four weeks. The results can be shown at Porter Mill in May. I am doing four still life drawings, each of flowers on a patterned tablecloth. 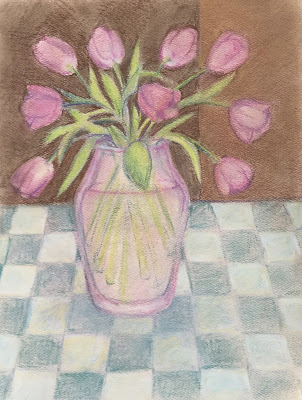 (I bought the tulips today so I could draw them.) It took me a while to get this drawing underway. Because I want all four drawings to work as a set, I wanted to work out the layout so that they would look good together. So I want the horizon line to be in roughly the same place, and the scale to be similar. I also want each drawing to have a slightly off-center composition, balanced by a vertical in the background. This time, I decided to use a checkered cloth, and I did a lot of measuring today. I also marked the dark squares so I won't make a mistake when I am putting in the color. Once I had the layout organized, I did a rough sketch of the tulips and vase. That's as far as I could take this today, but so far I am happy with this drawing. I meant to post this a few days ago, but forgot. Here is a closeup of the pansies that I drew in my conte crayon drawing, posted here on April 8. Today I cropped this image from the original photo. This drawing is a mock-up of my design for the codfish I am going to decorate for the Marblehead Art Association. 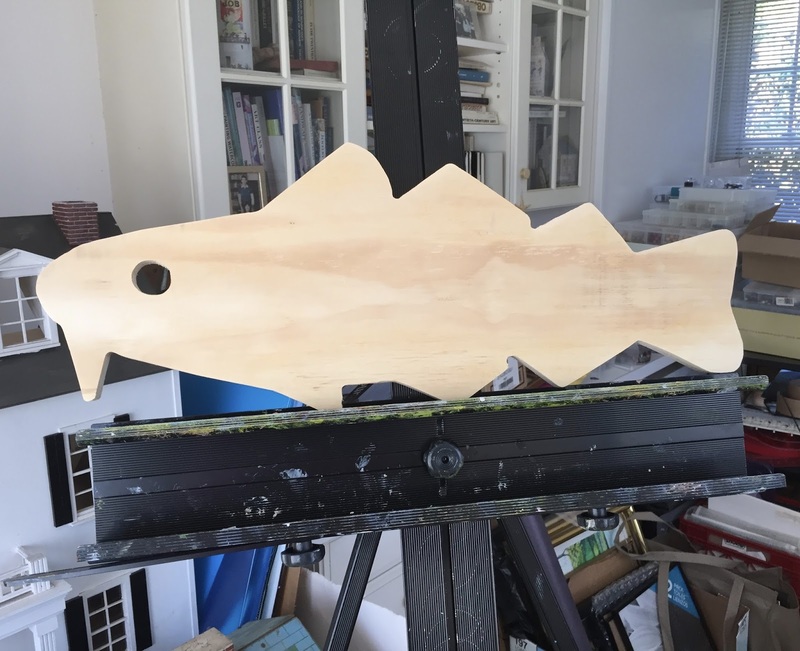 I am among a group of local artists who are decorating wooden codfish, to be displayed in Marblehead and then auctioned off to benefit Marblehead Festival of the Arts. I also participated in this event last year, and you can see what I made if you follow this link: www.flickr.com/photos/randiart/17469011928/ This year, I am going to decorate my codfish with a Portuguese theme. When I visit Portugal, I see bacalhau (codfish) on every menu. 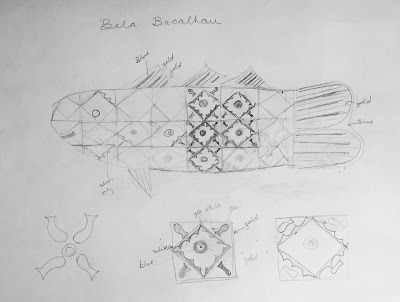 So this year, I am calling my codfish "Bela Bacalhau" and I am taking my inspiration for the decoration from blue and white Portuguese tiles (azulejos). My idea is to use square tiles that with diamond-shaped patterns on them. The idea is to suggest fish scales. 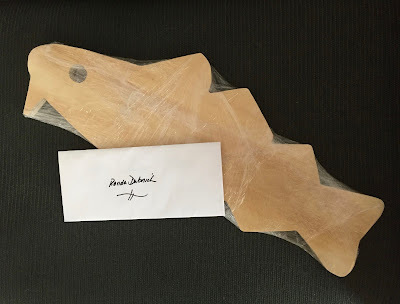 I had already created an original pattern for the 'tiles' and drawn a rough sketch (see my post for April 7) but today I wanted to work out the placement and size of the pattern to scale (no pun intended.) So I decided to do a drawing, actual size, before I start painting the wooden version. To get a piece of paper that was long enough, I cut two grocery sacks and taped them together. 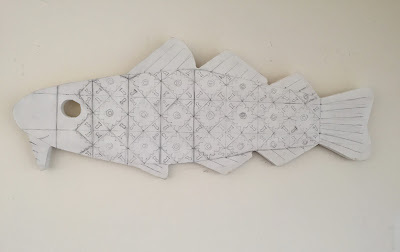 Then I traced my wooden fish cutout and went to work measuring equal squares to represent the tiles. When the placement was correct, I did a rough sketch of the design in each square, using pencil. Where I had taped the two pieces of brown paper together, the pencil wouldn't work, so I used blue marker just in on the taped area. I was really pleased with the design, but it was hard to get the pencil design to show up in a photo. So I decided to go over all the lines with blue marker. I am glad I did because it gave me a better idea of how the design will look. In fact, I like the drawing for its own sake, and now regret not using better paper! Some of the artists who have studios at Porter Mill here in Beverly, MA, are participating in a challenge tomake one new piece of art per week for four weeks. 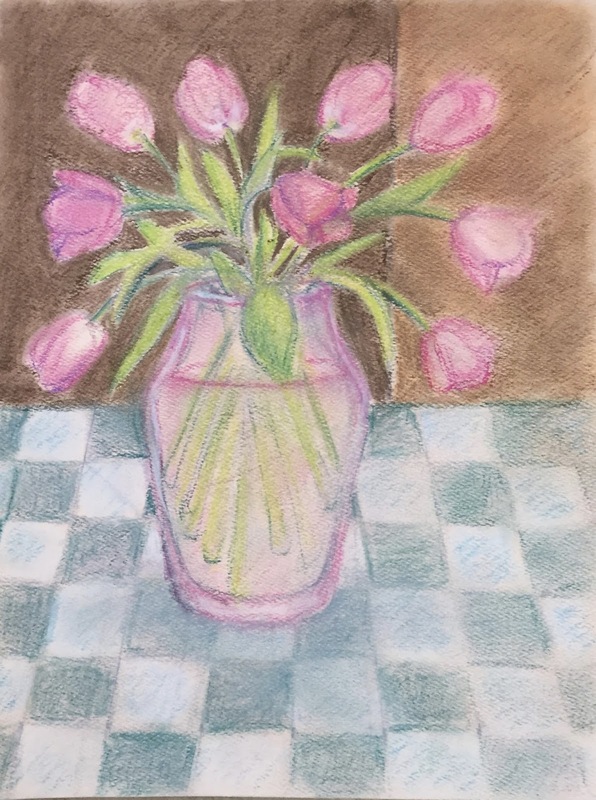 I decided to do four still life drawings in conte crayon. These may be included in a show in May. I started this drawing a few days ago as my drawing for week 1. Today I revised the background and foreground because I wanted to modify the colors. This morning I worked a lot on both the tablecloth and the back wall, trying to make all the colors relate to each other. I also reworked the squares on the tablecloth and accentuated the lines. 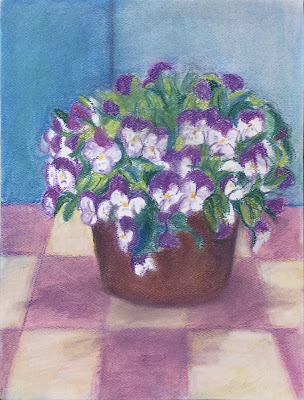 I was pretty happy with the foreground, but late this afternoon, I reworked the background again, going with darker blue-violet to make the pansies "pop". Now this is the basic drawing, though I may make some minor corrections. 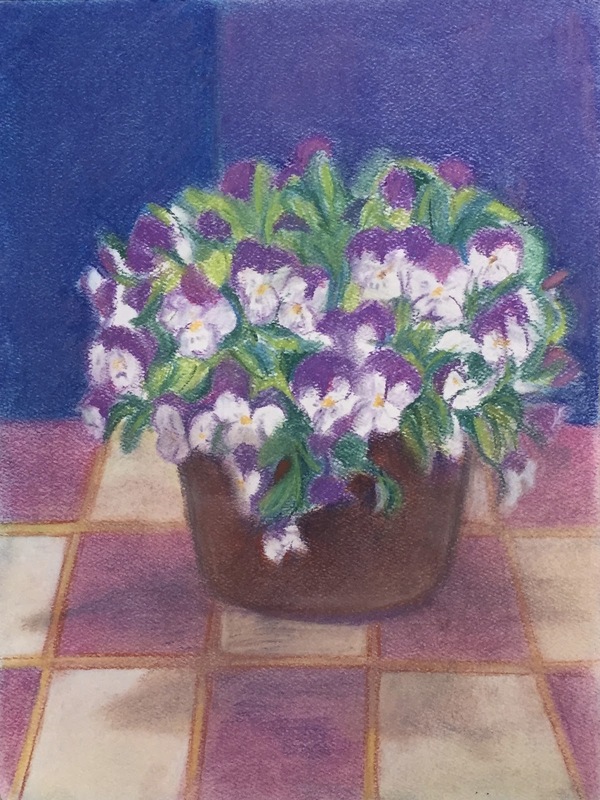 I plan to do three more still life drawings in this set, all pots of flowers on a tablecloth, with variations in the colors. I started this still life this morning, with colored conte crayons. I am participating in Porter Mill Artists four week challenge to produce one work for each week in April. I decided on still life drawing with pastel or conte crayon, something that I really enjoy but haven't done for a while. I had everything I needed to draw this morning -- except the subject. 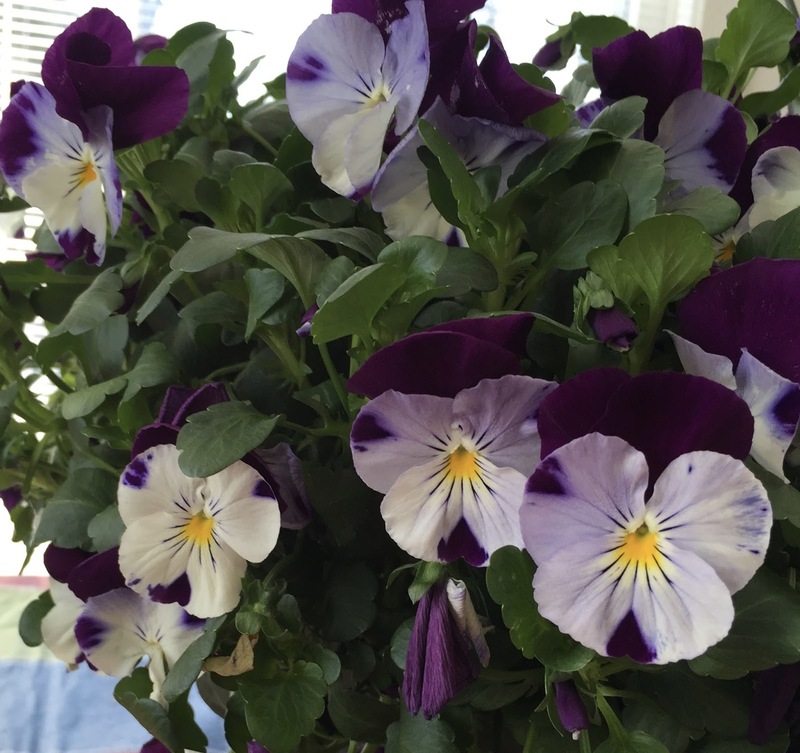 I was thinking about running out to the grocery store to buy a bouquet of flowers but remembered that my daughter recently bought me a big pot of pansies for the deck. But because of our recent cold snap and snowstorm, I had brought them inside and have been keeping them warm in my home studio. So I grabbed the pansies, put them on the table, and got started. This is my drawing after about an hour and a half. There are still some things I want to fix, and I may adjust the background colors, but I enjoyed this exercise and am pretty happy with the results. 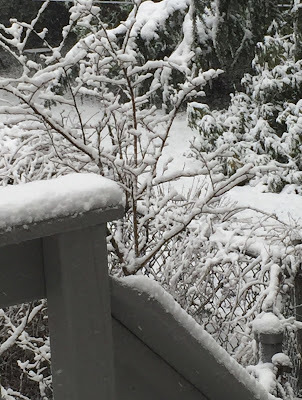 It's early April, but here north of Boston, we had snow last night. This was the view out the back door this morning. I liked the way the snow revealed the textures of the fence, branches, and stairs, so I took a picture. This morning I drove to Marblehead. My errand was to pick up my wooden cod cut-out because I am going to decorate a wooden code to be auctioned off in a fundraiser for the Marblehead Arts Festival. (More on this event later, but here's a quick link: www.marbleheadfestival.org/?s=codfish ).This morning, the pickup location was at my friend Tammy's house. It was lovely to see her! 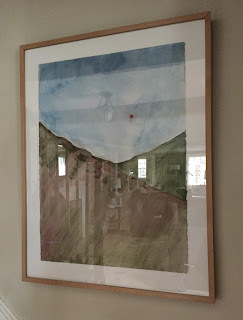 And when I went in her house, it was nice to to see my painting on the wall. It made me smile to see it there, so I asked if I could take a quick picture. I don't mind the reflections, because what I see there is the house of a friend.